In recognition of nurses and of the impact they make in the hospital and throughout the healthcare field, Beebe Medical Center has established three prestigious nursing awards -- The Award for Nursing Excellence, The Award for Nursing Leadership, and The Award for Nursing Scholarship. These awards were presented at a special ceremony to three Beebe Medical Center, long-time nurses who have continually exemplified the qualities to which all nurses aspire. The nurses are: Eleanor P. Cordrey, RN, who received the Award for Nursing Excellence; Bonnie Austin, RN, BS, who received the Award for Nursing Leadership; and Connie Bushey, MSN, Med, RN, Executive Director of the Margaret H. Rollins School of Nursing at Beebe Medical Center, who received the Award for Nursing Scholarship. Eleanor P. Cordrey, who retired from Beebe Medical Center in 2000 after 50 years of service, continues today in a volunteer capacity. She graduated Beebe School of Nursing in 1951 and moved right into working at Beebe Medical Center. Though Eleanor worked just about everywhere in the hospital over the years, she predominately is known for what she did in Women’s Health. She set up the neonatal resuscitation program and the Labor and Delivery program. She is known for putting her patients’ concerns first and building relationships on trust, always including families in treatment decisions. She taught until she retired, and continues to mentor others, encouraging them to reach for their dreams and to obtain their nursing degrees. Bonnie Austin, who is a Nurse Supervisor in the hospital, has the reputation for focusing on best practices, even before the Joint Commission was there to remind us of what processes and procedures should be followed. She is known as someone who leads by example and is a strong team member, fostering collaboration between interdisciplinary teams and exhibiting strong conflict resolution skills. Bonnie graduated from the Beebe School of Nursing in 1962. After graduation, she earned a Bachelor’s in Nursing from Wilmington College (now University). She worked in the Medical-Surgical Unit at Beebe and was the Head Nurse in Pediatrics. She recalls that in 1968 she unexpectedly moved to the Beebe School of Nursing, where she taught Pediatric Nursing. She taught for 31 years and then in 1999, returned to the hospital as a Nursing Supervisor. This year she is celebrating her 50th anniversary with the hospital. Connie Bushey has been continually committed to the education of nurses. Today, she remains the Director of the Margaret H. Rollins School of Nursing at Beebe Medical Center, leading the former Beebe School of Nursing into a new era of continued education and advancement in the education of nurses. Connie graduated from the Beebe School of Nursing in 1968, and worked as a nurse at Beebe Medical Center from 1968 to 1970. She earned her Bachelors of Science in Nursing from the University of Iowa in 1973 and then became an instructor at the School. She earned a Master’s in Education form Salisbury State in 1980 and the following year became Curriculum Coordinator. In 1989, she took over as school Director. Because it was necessary for the school’s recertification, she attained a second master’s degree. In 2011, she earned a Master’s in Nursing from Wilmington University. Connie has led the growth and expansion of the School of Nursing, the only hospital-based nursing school in the state. She has made sure that the curriculum has been updated to meet the changing needs of the healthcare profession. She has made certain the School has maintained high standards and that it has the affiliations necessary with other teaching institutions to afford the students the best possible education. School graduates have attained among the highest board pass rates of the state. Students also have the opportunity to further their nursing education through articulation agreements with Wilmington University and the University of Delaware. Connie says that faith has driven her in her career to support others in their quest for education, and to improve the quality of the education available. The awards were presented at Beebe Medical Center where the honorees’ friends, family members and peers attended the ceremony. A committee of Beebe Medical Center nurses chose the honorees. The process was a lengthy one, with committee members making sure that they captured the essence of what it is to be a nurse, specially a Beebe Medical Center nurse. 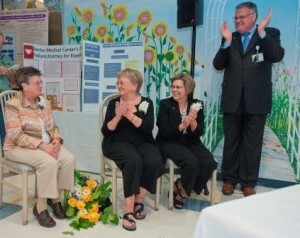 Caption: Beebe Medical Center presented three, new nursing awards during Nurses’ Week. Pictured here, left to right, Eleanor P. Cordrey, RN, who received the Award for Nursing Excellence; Bonnie Austin, RN, BS, who received the Award for Nursing Leadership; and Connie Bushey, MSN, Med, RN, Executive Director of the Margaret H. Rollins School of Nursing at Beebe Medical Center, who received the Award for Nursing Scholarship. Paul Minnick, RN, MSN, NEA-BC, Vice President of Patient Care at Beebe Medical Center, acknowledges the announcement of Eleanor’s award.